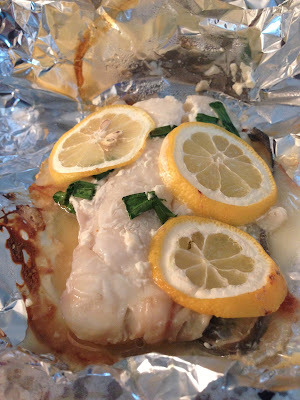 Lay halibut out on foil, skin side down. Evenly coat the halibut with the Miracle Whip. Finely chop the green onion and sprinkle evenly over the halibut. Thinly slice one of the lemons, and the entire grapefruit and distribute over the halibut. Grill on low heat for approximately 30 to 45 minutes depending on how thick the meat of the fish is. Hubby Rating: 10! Which is amusing, as he was a bit non-plussed about how I chose to prepare the halibut prior to eating, and then once he had dinner, he couldn't get enough! Triumph!! This was so easy and delicious, I will definitely be making this dish again!